Call us a little strange (it wouldn't be the first time), but we think it is pretty hard to make a 1959 Dodge W100 Power Wagon any cooler than they were when they left the factory. The combination of the Power Wagon's Forward Look styling and rugged functionality make them a nearly perfect old truck in our eyes—even in showroom stock condition. Having said that, it seems the builder of this Power Wagon managed the near-impossible when they significantly upped the cool factor of this old Dodge by adding a newer Cummins Diesel and an updated five speed manual transmission. Perhaps even more amazing is the fact someone is willing to part with this ultra cool old truck—it's currently listed for sale on Ebay. 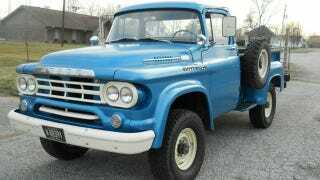 Although "Power Giant" era Dodge trucks—made between 1957 and 1960—obviously never came with a 4BT Cummins Diesel or a five speed Ford ZF transmission, after one look at this truck we certainly wish they had. The combination of a more modern driveline and this classic Power Wagon result in a great looking unique truck that can manage an impressive 23 MPG. We imagine this is at least double what the W100 could have managed with its optional factory "Power Giant" 205 horsepower 318ci V8. Aside from a few Cummins emblems and the Turbo Diesel script on the tailgate (perhaps the only thing we don't like about this truck) you'd never guess this Power Wagon was anything else than what it appears to be—a nicely restored old truck. That is of course until you hear the truck start and the decidedly non gas powered sound of the engine reveals this Power Wagons unique secret. Not surprisingly, we aren't alone in our enthusiasm for this interesting old Dodge—although the truck hasn't met reserve bidding is up to $15,650 with over a day left on the auction. Judging by the amount of interest and how cool this truck is, we would guess if the reserve is at all reasonable this unique Power Wagon will find a lucky new owner by the end of the weekend.